Sign up and join us in the car corral and watch some cool old cars race (including Datsun’s) Show off your Z pride for 1 or all 3 days. 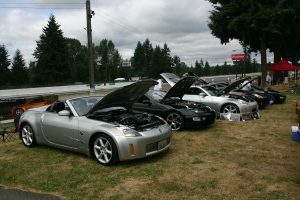 Our Premier vintage event, and one of the country’s most prestigious, is the Pacific Northwest Historics. Every year we salute a special car or class of cars, this year we are featuring the great racing tradition of IMSA. Expect to see several special IMSA cars on the track and in the paddock. Three days of racing are offered, and over 200 cars are expected to enter. Special features include a great vendor’s row, Saturday’s Salmon barbeque, and many other events that make the PNW Historics special. This entry was posted by Janene Mullen. Bookmark the permalink.